Zambia Zambia is a landlocked country in Southern Africa boasting an abundance of natural attractions. The sheer size of the country coupled with the fact that it has largely managed to avoid too much commercial tourist development means that those who do explore her manage to do so unhindered by the massive tour groups her neighbouring country sees, allowing for a more intimate and personal experience. Zambia has a number of breath-taking attractions to lure tourists with including the mighty Victoria Falls offering all the adrenaline-filled activities you could wish for including bungee jumping, white water rafting, abseiling and taking a dip at the edge of the falls in Devil’s pool. A vast number of game parks cater for nature lovers and there is also the opportunity to experience the charm and character of any number of small towns, each with their own distinct character and appeal. 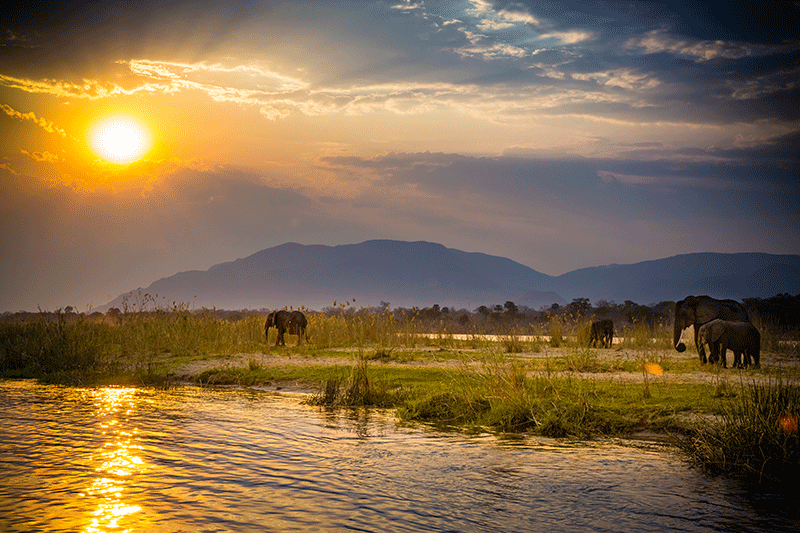 Zambia is a vast, magical and untainted gem just waiting to be discovered. 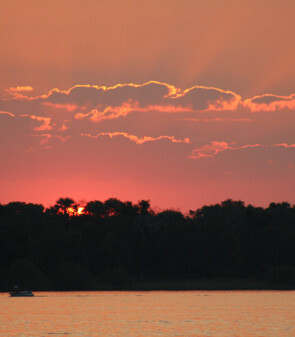 Best time to visit Zambia Zambia enjoys a warm climate year round. The best time to visit is during her winter and spring months, between June to September, when the days aren’t too hot. It’s also prime game viewing time. The average day temperature during this time is a pleasant 24° C. The rainy season is generally between December and April and the average daytime temperatures during this time can reach upward of 35°C. Due to the rain and very hot temperatures, many of the lodges close over this time as roads often become impassable. Climate and Weather The summer months in Zambia are between November and March where the climate is hot and most of the rainfall occurs. Average daily temperatures range between 25°C and 35°C. Humidity levels are high and it can become very unpleasant to be outside. Between May and August it is cooler and dry with average temperatures measuring between 6 – 24°C. Although the morning temperature can be quite cool, the daytime temperature are warm. There are no compulsory vaccinations required for entry into Zambia, however, the following should be considered: Typhoid, polio, rabies and hepatitis A. Malaria is endemic in Zambia so it is essential to take the necessary precautions to avoid being exposed to the disease. Medical facilities are under-developed and very limited so it is essential to ensure you have full travel insurance which includes cover for medical evacuation by air. Also make sure you carry a good and well equipped personal first aid kit with you for any smaller incidences that may occur. Most visits to Zambia are trouble-free, but visitors should be aware that there are incidences of car hijackings, armed robberies, mugging, bag-snatching and theft from parked cars as is common in other parts of the continent. Be vigilant and avoid as far as possible openly displaying valuables. Tipping in Zambia is generally discouraged and most establishments automatically include a 10% service charge on the bill. Women should remain respectful of the Zambia culture and avoid wearing short skirts and dresses and low cut tops. Homosexuality is considered illegal so gay travellers should be discreet and avoid public displays of affection. Square three-pin plugs, as well as two- and three-pin round plugs are used. Lusaka International Airport is located about 15kms northeast of Lusaka and is serviced by a number of airlines coming from different African cities. There is a domestic and International terminal. The Harry Mwanga Nkumbula Airport in Livingstone is the closest airport to the Victoria Falls and has recently undergone a major expansion due to the growing number of people visiting the region. There are many car hire companies in Lusaka, Ndola, Kitwe and Livingstone, offering a range of vehicles. Some offer a flat weekly rate, but most charge a daily rate plus mileage, insurance and petrol. You can also hire a chauffeur. Many of the hotels and lodges also offer a transfer service. There are many taxis available outside the main airports and visitors are advised to negotiate the rates prior to getting in the taxi. Zambia has an extensive network of roads of which only about a third are tarred. If you’re doing a road trip through Zambia, it is essential to carry a range of tools and essential spares with you in case of an emergency. Avoid travelling at night as many of the roads are unmarked and stray animals are often wondering on or next to the road. Roadblocks are frequent so ensure you are carrying all the correct paperwork at all times. These include a valid international drivers licence and vehicle ownership papers. Be sure to have all your vehicle papers on hand as you’re bound to encounter a few roadblocks and if you ever need to stop, pull well off the road. The Zambian currency is the Kwacha (ZMW), divided into 1,000 ngwees. It is best to use US Dollars which can be exchanged at the many bureaux de change found in the main towns; most of the tourist hotels, restaurants, travel agents and larger shops, especially in Lusaka and Livingstone, accept credit cards, but in the rural areas they will only deal only in local currency. ATMs are available in some of the major towns. The official language is English The international dialling code for Zambia is +260. Wi-Fi is limited to top hotels and restaurants.